This is mainly of interest to economists, but given the importance of these issues, I have tried to write it in an accessible manner. In that post I was careful to distinguish between academic research and policy. Of course macroeconomists research many things, and only a minority are using New Keynesian models, and probably even some of those do not really need the New Keynesian bit. That is the great thing about abstraction. Working with what can be called ‘flex price’ models does not imply that you think price rigidity is unimportant, but instead that it can often be ignored if you want to focus on other processes. So in terms of research I talked about the significant divide being between mainstream and heterodox. In terms of research, mainstream macroeconomists talk the same language. I used the term anti-Keynesian in the context of macroeconomic policy, and in this context I was not talking about academics, but the set of economists involved with macro policy. They could be academics, but they could be working for central banks, a finance ministry, or an international organisation like the IMF or OECD. For this group, I think we have good reason to believe that the large majority are not anti-Keynesian. Just look, for example, at any central bank publication discussing recent movements in output. This will typically focus on movements in components of aggregate demand: consumption, investment etc. The reason is a belief that output in the short run is demand determined. That, for me, is the defining feature of Keynesian analysis. If you look at the core models used in central banks (which, unlike models used by academics, need to be ‘horses for all courses’) the same will be true. Now Nick Rowe and David Glasner suggest that this view is not uniquely Keynesian - I could equally call it monetarist, for example. But what then are the criteria you will use to restrict the Keynesian set today? Different views about unconventional monetary policy? Different views about the efficacy of fiscal policy at the zero lower bound? This seems way too narrow. People have views about the relative merits of fiscal policy for all kinds of reasons, which may be very context specific, so this does not look like a good method of defining a label for economists today. Yet not everyone is a Keynesian using my deliberately broad definition. The only logical way to make sense of statements like those discussed here, for example, is to imagine we are in a world where output is determined from the supply side, so if one particular component of demand, like government spending on goods and services, goes down its impact on output will be offset by some means. That is an anti-Keynesian view. My first anti-Keynesian myth is that among economists involved with policy this is not a minority view. The second myth is that all you need to justify this anti-Keynesian view is to observe that wages and prices move in response to booms and recessions. For example Roger Farmer points to negative inflation following the Great Depression. Language can be confusing here. As an analogy, suppose someone has been ill, and you ask them whether they are now better. Do you mean better than they were (but still ill), or completely recovered? For us to take an anti-Keynesian view, we do not just require prices to move, we require them to move by just the amount needed so that we can ignore demand. So, for example, in an open economy under fixed exchange rates, for a devaluation to have no demand impact requires prices to immediately rise by the same amount. Prices will begin to rise for sure, but ‘flexible prices’ means more than that. If we take a simple closed economy, then ‘flexible prices’ is short for the real interest rate (nominal rates less expected inflation) always being at its ‘natural level’, which is the level that ensures demand matches supply. This immediately tells you that we are not just talking about price flexibility, but also monetary policy. Imagine in this economy there is a negative demand shock, caused by a fall in government spending. In this economy, the immediate impact is that firms will reduce output as well as prices. To offset this, the natural interest rate will fall to increase private consumption. Will the actual real interest rate do the same? This could happen without prices changing if the central bank cut nominal rates by exactly the required amount. It could happen without the central bank doing anything to nominal rates if expected inflation rose by exactly the required amount. Or it could be some combination of the two. One justification for assuming that the real interest rate is always at its natural level is that monetary policy is super efficient, moving nominal rates to always offset the impact of demand shocks. For some reason this is not an argument anti-Keynesians usually make. The alternative justification is that, conditional on whatever monetary policy does, prices move by just the amount required to give you the expected inflation rate necessary to generate the natural real interest rate, and therefore offset the demand shock. This becomes clear when nominal interest rates are stuck at the zero lower bound. In that case, the natural real interest rate is large and negative, but monetary policy cannot get there because nominal interest rates cannot be negative. For flexible prices to get you to that real rate you would need expected inflation to be significantly positive. (We now believe there is no independent Pigou effect (or real balance effect) that will save the day.) As Roger shows, actual inflation from 1929 to 1933 was persistently negative. One must presume that inflation expectations were also negative. So clearly although prices were moving, they were not moving in the way required for the anti-Keynesian view to hold. Far from casting doubt on the Keynesian story, falling prices during the Great Depression show how unrealistic the anti-Keynesian view is. Some write as if this were true. The story is that after the New Classical counter revolution, Keynesian ideas could only be reintroduced into the academic mainstream by accepting a whole load of New Classical macro within DSGE models. This has turned out to be a Faustian bargain, because it has crippled the ability of New Keynesians to understand subsequent real world events. Is this how it happened? It is true that New Keynesian models are essentially RBC models plus sticky prices. But is this because New Keynesian economists were forced to accept the RBC structure, or did they voluntarily do so because they thought it was a good foundation on which to build? One way of looking at this (and I’ll argue at the end that it misses a key element) is to think about the individual components of models. If you do this, the Faustian bargain story looks implausible. Let’s start with the mainstream before the New Classical revolution. This was the famous post-war neoclassical synthesis popularised by Paul Samuelson, which integrated traditional Keynesian and Classical models in a common overall framework. While prices were sticky we were in a Keynesian world, but once prices had adjusted the world was Classical. In terms of components, the RBC model is just the classical macromodel with two key additions. The first is rational expectations. The second is intertemporal optimisation by agents. (In non-jargon, it takes seriously the ability of agents to choose when they consume by saving or borrowing, rather than simply assuming they just consume a fixed proportion of their current income. This is often called the consumption smoothing model, because typically consumers smooth consumption relative to income e.g. by saving for retirement.) In both cases I do not think Keynesian economists were forced to adopt these ideas against their better judgement. Instead I think quite the opposite is true: both ideas were readily adopted because they appeared to be a distinct improvement on previous methods. The key point here is that they were an improvement on previous practice. It does not mean that economists thought they were the final answer, or indeed that they were half adequate answers. Instead they were a better foundation to build on compared to what had gone before. I’ve argued this for rational expectations before, but I also think it is true for intertemporal consumption. I find it very difficult to think about more complex ideas, like liquidity constraints or precautionary saving, without starting with consumption smoothing. I have talked about the real world events that convinced me of this, but here let me make the same point in a more informal way. When teaching on the Oxford masters programme, I give students a question. If they won a large sum, would they spend it over the next year, over the next few years, spend a significant proportion now but save the rest, or save nearly all. The last response is the answer given by the simple intertemporal model, but I argue that the first two responses make perfect sense if you are a credit constrained student. However I tell my audience that those who gave the first answer are not intending to do a PhD after finishing the masters, while those who gave the second are, because they are expecting the credit constraint to last longer. The serious point is that credit constrained consumers do not automatically consume all of a temporary increase in income. If the period over which income is higher is less than the period over which they expect to be constrained, they will smooth their additional consumption. So, in terms of the components of New Keynesian models, I can see little that most modellers would love to junk if it wasn’t for those nasty New Classicals. But what this ignores is methodology, and the fact that the RBC model is a microfounded Classical model. (By microfounded, I mean that every macroeconomic relationship has to be formally derived from optimisation by individual agents.) Yet here again, I doubt that most New Keynesian modellers adopted the microfoundations perspective against their better judgement. Instead I suspect most saw the power of the microfoundations approach (in analysing consumption, in particular), recognised the dangers in ad hoc theorising about dynamics (as in the traditional Phillips curve), and thought there was no contest. The more interesting question is whether this has turned out to be a Faustian pact between macroeconomics and microfoundations ex post. To be more precise, by putting all our macroeconomic model building eggs in one microfounded basket, have we significantly slowed down the pace at which macroeconomists can say something helpful about the rapidly changing real world? That is a question I have written a lot about (e.g. here, and here) and no doubt will write more, but the key point I want to make now is this. If there was a Faustian bargain, I think we should acknowledge that most Keynesian economists agreed to it for good reasons, and that they were not forced into it by others. I must add a caveat here, although it is rather controversial. I think one sense in which RBC models have cast an annoying shadow is the idea that we must have models in which labour supply is endogenous. Often it would make things simpler if we could assume a fixed labour supply, and my own view is that for many issues we would lose little empirical relevance if we did so. Here I do think New Keynesians are too deferential to the always silly idea of trying to explain movements in unemployment as simply a labour supply choice. The British establishment is excessively secretive, and the Bank of England is part of that establishment. I have for too many years (e.g. pdf, para 105) argued that central banks should publish their forecast for the interest rate they set. Unsurprisingly the innovative New Zealand Fed did it first, followed by the ever rational Swedes and Norwegians, and then of course the US Fed itself. I really did hope that at this point the Bank of England’s line that the naive British public would not understand the difference between a forecast and a commitment would buckle, but no, the Bank continued to base its forecasts for everything on the market’s forecast for interest rates, rather than their own. Even wise ex-MPC members continued to suggest all this openness elsewhere would end in tears. Things began to change with Canadian Mark Carney’s arrival as governor. In my view there were two things the forward guidance he introduced last August was trying to achieve. The first was to clarify what the MPC’s objectives were. In particular, they were not (or at least were no longer) trying to target two year ahead inflation regardless of what was expected for output or unemployment. The second aim was to give a clear indication that the MPC (or at least the governor) did not think rates were going to rise anytime soon. This is important, because it either gives us additional information about the Bank’s forecasts or their objectives. Now many in the press have made great play about the fact that the Bank got its forecast for unemployment wrong, and that therefore the August guidance lasted only 6 months. I love the way journalists can at the same time write that macroeconomic forecasts are ‘notoriously’ unreliable (even though it is a well known and acknowledged fact), and at the same time think that the headline ‘Bank makes forecasting mistake’ is somehow news. But Carney was not providing a forecast for unemployment because he thought that forecast was going to be particularly good, but because he wanted to convey his current view about when interest rates were likely to rise. As his view has not changed, then he is quite justified in claiming that the August guidance was worth doing. What we had yesterday was not really a new version of forward guidance, but rather another stage in making public the information the Bank is basing its thinking on, and a further nudge towards publishing an interest rate forecast. We have (pdf) “When Bank Rate does begin to rise, the appropriate path so as to eliminate slack over the next two to three years and keep inflation close to the target is expected to be gradual.” So you can think of that as a kind of average of the individual committee member forecasts that the Fed publishes, in non-numerical form! We also now know much more (pdf) about the forecast behind this judgement. As this post from Tony Yates makes clear, this must be very frustrating for those who were or still are inside the Bank and had been arguing for more openness for many years, but before Carney to no avail. Chris Giles makes the point very clearly. Yet, as Tony says, Carney has not swept away all the cobwebs yet. You still have the silly position of the Bank publishing a forecast which is entirely their own work apart from one key variable - interest rates (where they use market forecasts) - which they actually set! There was plenty more of interest in the inflation report. One was the Bank’s view about what economists call the natural real interest rate in the medium term, which they think is going to remain low compared to historic levels. It’s partly for this reason that they do not think nominal interest rates are going to rise very quickly. In other words, they are part converts to the secular stagnation idea. Their large upward revision to expected growth was good news, but their rather low (and until now fairly secret!) estimate of the output gap was not. It was interesting that Carney described the UK recovery so far as “neither balanced nor sustainable”. The really big news on the UK economy, floods apart, continues to be the stagnation of productivity growth, which is partly why the Bank got its forecast of unemployment wrong. However we have recently had some good news on that front from another bank. At least amongst workers at Barclays Bank productivity grows apace. How do I know this? Because their bonuses continue to increase, even though profits are down. And as at least one comment on my earlier post on executive pay said, the 1% are just getting paid more because they are getting more productive. There are three reasons why the government should be very worried about the political fallout from the unprecedented level of UK flooding. 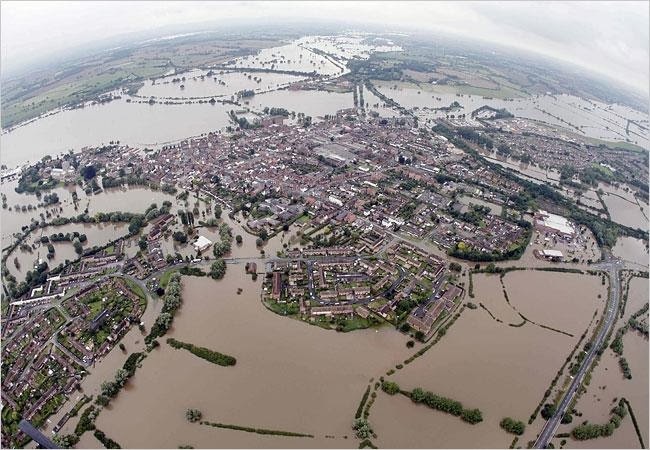 2) The reason why there was a need to increase spending on flood prevention was climate change. This was well understood by the relevant government agencies and departments, so it is no surprise that the Met Office should confirm the link. Yet the government is vulnerable on this because so many of its MPs are active or closet climate sceptics, including the minister in charge of the relevant department. 3) The government’s philosophy towards the public sector is to roll back or privatise. No doubt there are some areas where this makes sense, but in others it is undoubtedly causing distress and hardship. Yet those affected typically have little political voice, and so are not too visible. In addition, many in the government have encouraged the idea that recipients of the welfare state are either undeserving, or victims of a dependency culture. In contrast, flood victims are very visible, and a strategy of blaming the victims will not work politically. So far the government’s attempts to avoid criticism have been remarkably successful. The strategy was clear - target the environment agency. Not those working on the ground, who were obviously working their socks off, but senior management at the agency, and in particular its chairman Chris Smith. The story was that the agency had been giving the government the wrong advice. That strategy has been remarkably successful largely because the BBC has played along exactly as planned. At first it appeared, as Simon Jenkins says, to allow “the Somerset branch of the NFU to write its newscasts.” When it comes to the cuts, it is either ‘views on shape of the earth differ’ stuff, or just not talked about. Driving home today I listened to Radio 4’s 5pm news program which led with 20 minutes on the political ramifications of the floods, and the government’s spending cuts were not mentioned once! However as the rain keeps coming and the floods spread, that diversionary strategy will lose its power as the facts become more widely known. The Financial Times reports today that “The Environment Agency has had to endure “massive” cuts to its budget since the Cameron government came to power despite warning this would affect its ability to defend the country against flooding, the agency’s chairman said on Monday.” A month ago the Daily Telegraph reported “Officials working on flood risk management will be sacked as Environment Agency sheds about 15 per cent of its workforce to save money, potentially placing ability to cope with floods at risk”. Cuts on this scale are difficult to pass off as ‘efficiency savings’ when villages and regions are isolated by the floods. As Alex Andreou notes, preventing flood damage and responding to emergencies “requires a well co-ordinated, firm, top-down response, and the spending of tax revenue to alleviate misery, on the strict basis of need rather than worthiness. At the same time, every ideological fibre in a neoliberal's soul must rebel.” Yet, as Rick points out, much of the danger from flooding comes from overwhelmed drains and sewers, and these are the responsibility of private water companies. These monopolies have received their fair share of criticism for not doing enough as they continue to make large profits. Cuts in flood prevention are a small part of austerity, but there are close parallels with the macroeconomic case. 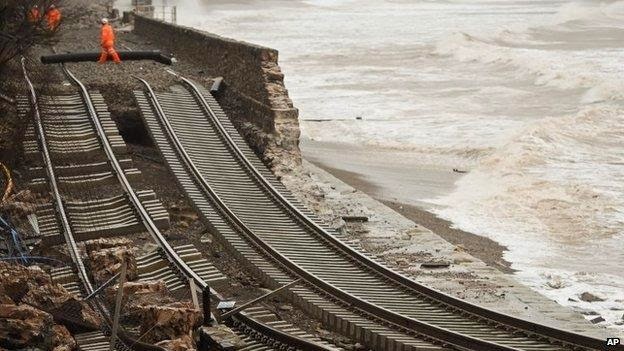 Just as ministers might have hoped that benign weather would not reveal the folly of cutting back on flood prevention, they also hoped that the economic recovery that began in 2010 would continue, and not be derailed by events like the Euro crisis. In both cases they were not lucky. Just as some in government never believed in all this climate change stuff, others thought that this Keynesian idea that austerity might be a bad idea at the zero lower bound was fanciful. (Some, like George Osborne, appear to have thought both.) When these mistakes became evident it was, with the floods, the Environment Agency’s fault, and also the last government, while with the recession it was all down to those Goddamn Europeans, and of course the last government. Yet whereas the links between austerity and prolonged recessions may appear mysterious to many, the links between lack of flood prevention and flooding are all too obvious. And the real danger for the government is that perhaps others may begin to see these parallels. Labels are fun, and get attention. They can be a useful shorthand to capture an idea, or related set of ideas. But is there really a New Old Keynesian school of thought? I don’t think so. Here are a couple of bold assertions, which I think I believe, and which I will try to justify. First, in academic research terms there is only one meaningful division, between mainstream and heterodox. (Of course the heterodox divide themselves up into various ‘schools’, but their size is small and their influence is also small.) Second, in macroeconomic policy terms I think there is only one meaningful significant division, between mainstream and anti-Keynesians. Of course all academic macroeconomists have their own idea of how the world actually works and will probably do research using models that roughly conform to that. Yet I think you would be hard put to draw meaningful boundaries here. Take John Quiggin’s Old/New Keynesian post, for example (which followed this from Tyler Cowen). He characterises New New Keynesians as those still working with DSGE models who are now attempting to add financial frictions. He wants to argue (and labels New Old Keynesian) the idea that following this recession, there “is no unique long-run equilibrium growth path, determined by technology and preferences, to which the economy is bound to return. In particular, the loss of productive capacity, skills and so on in the current depression is, for all practical purposes, permanent.” Now listening with my mainstream ears, this sounds like a combination of hysteresis effects and endogenous growth, which sounds interesting. Yet I also think we can learn a lot from adding financial frictions to DSGE models. Does this make me a middle aged Keynesian? What I suspect Quiggin is getting at here is that New New Keynesians are still following a microfoundations research programme (using DSGE), whereas he would not. Now many mainstream macroeconomists, myself included, can be pretty critical of the limitations that this programme can place on economic thinking, particularly if it is taken too literally by microfoundations purists. But like it or not, that is how most macro research is done nowadays in the mainstream, and I see no sign of this changing anytime soon. (Paul Krugman discusses some reasons why here.) My own view is that I would like to see more tolerance and a greater variety of modelling approaches, but a pragmatic microfoundations macro will and should remain the major academic research paradigm. When it comes to macroeconomic policy, and keeping to the different language idea, the only significant division I see is between the mainstream macro practiced by most economists, including those in most central banks, and anti-Keynesians. By anti-Keynesian I mean those who deny the potential for aggregate demand to influence output and unemployment in the short term. Why do I use the term anti-Keynesian rather than, say, New Classical? Partly because New Keynesian economics essentially just augments New Classical macroeconomics with sticky prices. But also because as far as I can see what holds anti-Keynesians together isn’t some coherent and realistic view of the world, but instead a dislike of what taking aggregate demand seriously implies. What is incoherent about believing in pretty flexible prices, you might ask? Two things. First, as I have argued before, with the demise of the Pigou effect flexible prices do not get you out of a deficient demand problem at the zero lower bound when there are inflation targets. Second, the evidence that prices are not flexible is so overwhelming that you need something else to drive you to ignore this evidence. Or to put it another way, you need something pretty strong for politicians or economists to make the ‘schoolboy error’ that is Says Law, which is why I think the basis of the anti-Keynesian view is essentially ideological. Of course there are a huge number of policy debates in macroeconomics, and you can attach labels to those if you like. Should we use fiscal stimulus at the zero lower bound, for example. Was austerity a good idea? However, anti-Keynesians aside, I don’t think these debates reveal large fault lines in economic thinking. Economists do not rigidly line up on one side or another, and some even change their mind over time as the facts change. It is possible to have serious discussions about the effectiveness of monetary policy, the dangers of high debt etc. The only group where a discussion can fail to get off the ground is with those who contend that aggregate demand is always irrelevant. Heterodox economists might argue that they have to be bilingual - they are able to speak mainstream, even if they prefer not to among friends. Those more critical might detect a reluctance to get past certain words. An alternative, and more positive, way to define the anti-Keynesian group is that they believe macroeconomic outcomes are essentially efficient, and so intervention by a government (or central bank, beyond providing a nominal anchor) is not required. This difference might be important in placing someone like Roger Farmer (who I’m glad to see now has a blog), who is not an anti-Keynesian under this positive definition, but might be using my more negative criteria. As I predicted earlier, all those repeat TV showings of Braveheart is slowly moving the polls on Scottish independence into ‘just maybe’ territory. OK, that is a bit flippant: as the Economist notes, the best recruiting agent for a Yes vote to independence is not Mel Gibson but George Osborne. Yet the problems that would have to be resolved if the Scottish people vote yes to independence are pretty serious. And the vote itself may depend on how these problems are perceived. For those not living in these Isles here is the story so far. The prospective Scottish government says it wants to keep sterling by forming a currency union with the remaining UK (rUK). The No (to independence) side (most rUK politicians) suggest that the terms that the rUK would set for establishing a currency union would be pretty onerous for Scotland (see the Eurozone). Indeed they hint that the whole idea of taking on some kind of lender of last resort role for Scotland might be so unappealing that rUK might just say no whatever. The pro Scottish independence (SNP) side respond that if the rUK takes that line, Scotland might decide not to take on its share of UK government debt. (What its share is remains unclear, and will also be the subject of complex negotiations.) This has apparently created some nervousness among UK debt holders, so the UK Treasury has recently taken the unusual step of saying that if Scotland becomes independent the rUK will guarantee all of the UK’s debt, and not just what it thinks is rUK’s share. Which, if you are in the SNP, might lead you to think that your threat of not taking on any UK debt is credible. That would be a foolish thing to believe. Suppose negotiations did break down, with rUK refusing to form a currency union with Scotland and Scotland refusing to take on any UK debt. Scotland would then have to decide whether to continue to use sterling, or have its own currency. But equally important, it would also have to start selling Scottish government debt to cover their inevitable government deficit. The interest rate it would have to pay on this borrowing would in all probability be much higher as markets would view its refusal to take on its share of UK debt as a form of default. However I suspect the situation would be even worse for Scotland, in that the rUK government would simply expropriate a share of Scottish oil tax revenue to compensate for the extra debt interest it had to pay. In the end this comes down to realpolitik, and rUK holds the ultimate cards. Another argument that the SNP has used is that it is in the rUK government’s interest to have a currency union with Scotland, and so this will keep it at the negotiating table and give the SNP some power. I think Scotland and rUK do meet optimal currency area conditions, so in theory this is true. However Scotland would be negotiating with the current government. The current government has shown, with its attitude to migration and an EU referendum in particular, that short term political interest trumps national economic interest. As a result, the SNP cannot bank on the rUK government pursuing the optimal policy from rUK’s point of view. Of course all this has a close parallel with debates about the Eurozone. Academic and international policymaking views on the Eurozone typically take one of two directions at the moment: either it was doomed from the start, or it has to move to a fiscal union. (See, for example, Dani Rodrik here.) The SNP position is therefore very difficult, because it wants to move to a currency union without a fiscal union. The Eurozone experience is hardly a good advert for that idea. However whether this is true or not is academic from Scotland’s point of view. It has to negotiate with the current UK government, which for various reasons will not see things in the way I presented them in the previous paragraph. To be fair, that is partly because my view is a minority view, and the governor of the Bank of England recently (pdf) put forward the more normal line that a currency union needs more centralised fiscal control. But it is also because a yes to independence vote will be a huge personal defeat for the current UK government, and they will want to do their utmost to demonstrate that the people of Scotland have made a big mistake. And as I said earlier, they will have the power to do that, whether it is in the economic interests of rUK or not. So I think it is a reasonable assumption that the SNP’s preferred solution of a Scotland-rUK currency union will result in very tight aggregate controls on what Scottish fiscal policy can do. Nevertheless credit risk will remain, so Scotland will end up paying more to service their share of UK debt than the rUK. The National Institute estimate (pdf) that under a currency union Scottish borrowing costs could be between 0.75 and 1.5 percentage points above UK borrowing costs. So if the Scottish people think that voting for independence will bring an end to fiscal austerity, I think they would be making a mistake.